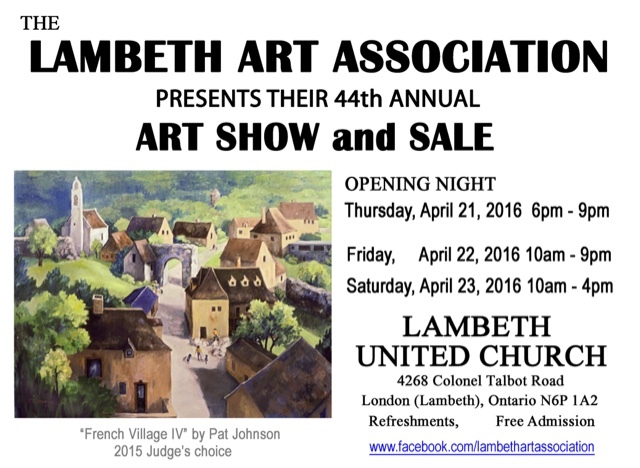 Wow what a show the annual Lambeth Art Association has put on. Every year after we hang the work we all comment that it's the 'best one yet'. Patrons have been commenting, agreeing with both words and their pocket books. It's always interesting to see how artists evolve. I think it's part of the creative psyche to continue to explore, and push. As one of my favorite artists Kim Harrison says, 'artists are problem solvers'. Very few true creatives are satisfied with staying the same. Solving the 'problem' whether it be composition, colour work, value pushing or any of a number of other issues makes the work exciting for the artist. Sometimes people ask how I can let my work go? The answer is that it's not the end result that interests me, it's the process involved in getting to that end result. If you have a few hours this afternoon you should pop in to Lambeth United Church and see the show. I'm sure you'll see many examples of creative minds playing, and pushing into new style evolutions.